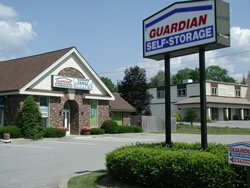 Guardian Self Storage in Fishkill, NY is conveniently located on Route 9 across from Lawrence Farms, home to Talbots and Jos. A. Bank. This property offers easy 24 hour, 7 day ground level access. Storage units ranging from a small closet all the way up to a 2 car garage. The perfect solution for our residential or commercial customers in need of extra space. Our Fishkill self storage property is located only a short driving distance from away Garrison, Cold Spring and Beacon.